Carl Frampton MBE will face Mexico’s Horacio Garcia in a ten round Featherweight contest on his highly-anticipated Belfast homecoming at the SSE Arena on Saturday 18th November, live on BT Sport and BoxNation. It will be the three-time World Champion’s first fight in his home city since he successfully defended his IBF Super-Bantamweight crown against American Chris Avalos at the same venue back in February 2015. Frampton went on to create history by becoming the first Northern Irishman to win World Titles in two weight divisions when he defeated Mexican Leo Santa Cruz in an unforgettable battle for the WBA Super Featherweight Championship in New York in July 2016. It was Frampton’s first fight as a professional at Featherweight, having moved up a division after unifying the IBF and WBA Super-Bantamweight titles by outclassing Scott Quigg in Manchester earlier that year. Garcia, 27, holds a top record of 33 wins from 37 contests; with 24 of those victories coming by way of knockout. Before a surprise loss to Diuhl Olguin, which he quickly avenged, his only career losses had come to two-weight World Champion Hozumi Hasegawa and rising star Joseph Diaz. “This is a fight that really excites me,” said Frampton. “Garcia will definitely come and have a go. He’s a typical Mexican warrior, he’s tough and he’s game and he’ll try and put it on me in front of my home crowd. “He has never been stopped in his career and has only lost to World class opposition, excluding the loss against Olguin. It will be good to get a fight in against a live opponent before I get one of the big boys in the new year. “This fight has been a long time coming and it’s good to be back out in Belfast topping a double World Title bill that also features my good friend Paddy Barnes defending his WBO European title. “It’s a great bill, probably the best bill that Ireland has ever seen, I don’t think people will criticise me too much for saying that. It’s a quality bill and to be topping it is a huge honour. Promoter Frank Warren said: “Carl is an Irish boxing legend and to be promoting his first fight back in Belfast since creating history is a huge honour. He is a fighting man and asked for a tough opponent on his big return. “Garcia holds a top record and will provide a test for him on November 18th. By the time the fight comes around, Carl will have been out of the ring for over ten months. He has a new trainer, management team and promoter, it is a lot for a fighter to have to deal with but I am expecting to see him back at his best next month. On the same bill, all-action Belfast hero Jamie Conlan finally has a dream World Title shot, he will be challenging tough Filipino Jerwin Ancajas for the IBF World Super-Flyweight belt; WBO Bantamweight World Champion Zolani Tete will be making the first defence of his crown against fellow South African Siboniso Gonya; and the hugely-popular triple Olympian Paddy Barnes makes the first defence of his WBO European Championship. Further exciting additions to an unmissable card will be announced in due course. 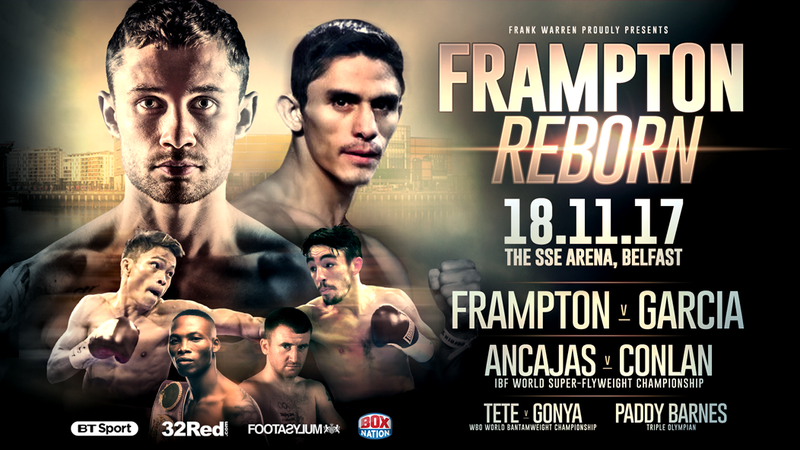 Tickets for Frampton Reborn will go on sale to the general public at 12 noon on Wednesday 4th October via the SSE Arena Belfast Box Office, www.ssearenabelfast.com and 028 9073 9074.